Sophomore right side hitter for the Lady Saints, Giovanna Tapigliani comes all the way from Sao Paolo, Brazil to play vollyeball for the Lady Saints. Tapigliani succesfully finishes her season earning titles of Jayhawk West Player of the week, NJCAA National Offensive Player of the Week and AVCA National Player of the Week. Coming from the huge city with a beach just two hours away, Sao Paulo-Brazil’s Giovanna Tapigliani had an eye opening experiencing in moving to Liberal. She left a city of 12.11 million people to a town barely boasting 19,800. “I saw a huge difference in the cities because Liberal is too small,” Tapigliani said. Activities and popular things to do were very different — beaches and malls versus walking around campus and Walmart. The food was different. The languages were different. But one thing was the same — volleyball. For years, Giovanna dreamed of coming to the United States to play but was afraid to because she didn’t know English. 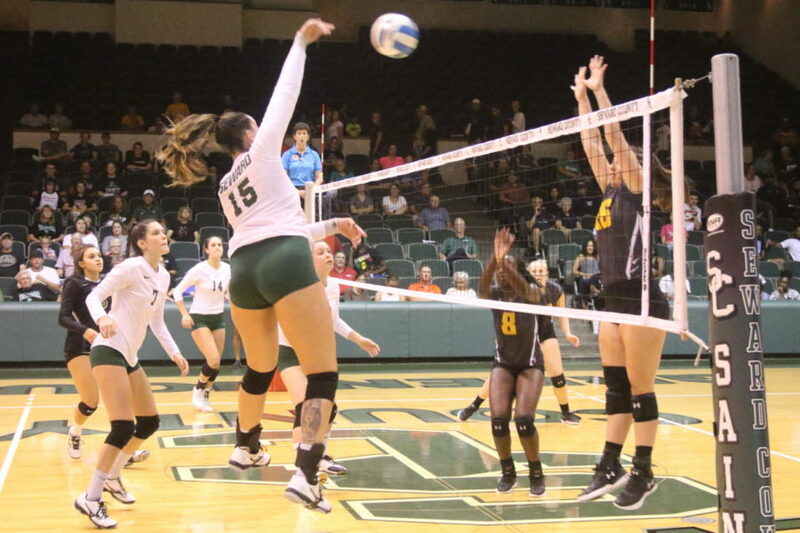 But in 2016, Tapigliani took the leap to start her volleyball career at Seward County Community College and “Go Big.” With the help of former Lady Saints Head coach, Thais Allen, she became one of the top junior college prospects in the U.S. But the road to get here was long. She began playing volleyball at the age of eight after her uncle who was a worldwide volleyball player noticed her talent. “My uncle started to notice that I was very tall and had a chance with volleyball. He keeps in touch with many coaches. He sent me to my first club in Brazil called ‘Sport Club Corinthians Paulista,’ where I stayed for five consecutive years,” Tapigliani said. Throughout her time at volleyball camps, Tapigliani played with a girl who later played at Seward County. The girl showed Coach Thais Allen Tapigliani’s playing videos and Allen began recruiting her and Tapigliani began the journey of coming to America. Giovanna Tapigliana has received around 12 offers to play Division 1 volleyball at a four-year college. Her top pick right now is Stephen F. Austin State University in Nacogdoches, Texas. After arriving at SCCC, she appeared in all 35 matches her freshman year. During that year, she was also named 1st Team All-Jayhawk West, Jayhawk West Freshman of the Year, Three time Jayhawk West Player of the Week and Wrangler Volleyball Classic All-Tournament Team. She finished with 435 kills that season. 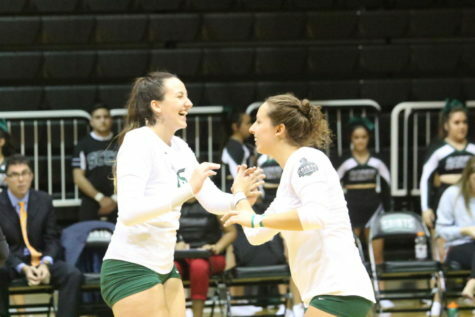 Sophomore Giovanna Tapigliani cheers with her teammate, Freshman Djuly Schmorantz. Tapigliani is a leader on the team and because of that she was also a Team Captain. 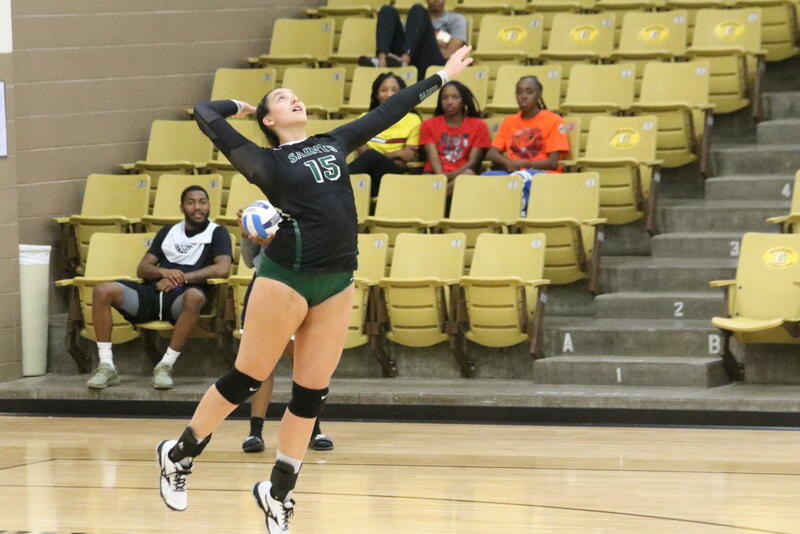 In her sophomore season, she received Jayhawk West Player of the week, NJCAA National Offensive Player of the week and AVCA National Player of the week. She improved the most this season in her passing. During the season, she was also Team Captain for the first time in the states. Tapigliani and her teammates places fourth in the NJCAA National Championships this season. The most memorable in her season was against the second ranked team. “I made twenty-seven points that night. We all played amazing,” Tapigliani said. Her goals for the future include finishing at Seward County Community College with a high GPA and choosing the best four-year school to attend out of her 10-12 Volleyball offers. Tapigliani’s top pick is Stephen F. Austin State University, a Division 1 school in Nacogdoches, Texas. While on the road to Division 1 volleyball, Tapigliani is majoring in International Business.